Cabbage capsicum salad recipe - This is a healthy, tasty, crunchy and very easy to prepare salad made from cabbage and capsicum. For the dressing, lemon juice, sugar and salt is used, a simple dish that anyone can make. Cabbage is known as gobi in hindi. kobi in marathi, elekosu in kannada, and capsicum or bell pepper is known as dhobli mirchi in marathi, shima mirch in hindi, donne mensinkayi in kannada and fugge mirsaang in konkani. This salad is low in calories and high in dietary fibers which keeps you satiated for a longer period. 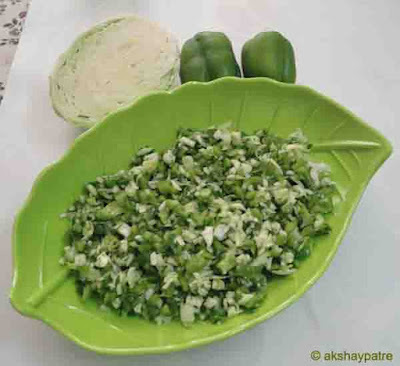 It is a perfect dish which can be prepared in a jiffy for lunch or dinner as a side dish. 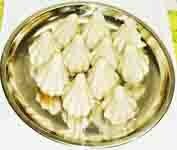 This can even be eaten as a whole meal if you are on weight loss diet. It is a delicious salad with sweet and sour taste. Prepare this salad at least once in a week and skip adding sugar if you do not like the sweet taste in it. 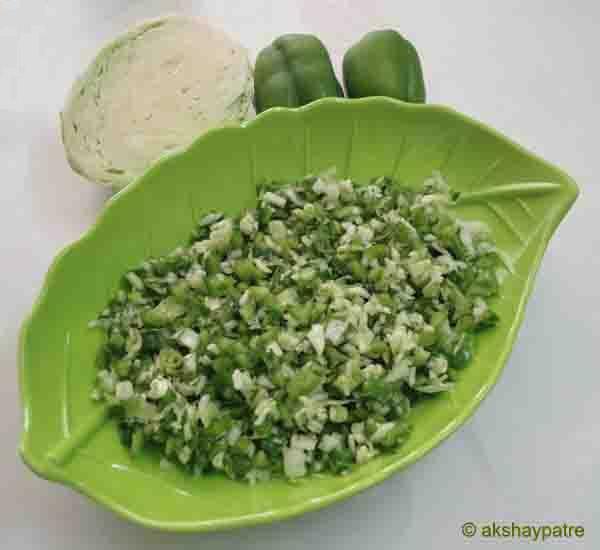 In case you would like to have it spicy you can use green chillies according to your taste and requirement. Wash the capsicums and set aside. Separate the cabbage leaves and wash them thoroughly. Cut the capsicums into two halves and remove the seeds and rind. Cut the cabbage and capsicums into small pieces and set aside. Squeeze the lime in a large bowl and add sugar and salt to it. Mix well till the sugar and salt dissolve in the lemon juice. Add the capsicum and cabbage. Mix well. Add the green chilli and chopped coriander leaves. Mix well. Serve as a side dish to pulao, biryani, rice and rotis. 1. Wash the capsicums and set aside. Separate the cabbage leaves and wash them thoroughly. 2. Cut the capsicums into two halves and remove the seeds and rind. Cut the cabbage and capsicums into small pieces and set aside. 3. Squeeze the lime in a large bowl and add sugar and salt to it. Mix well till the sugar and salt dissove in the lemon juice. Add the capsicum and cabbage. Mix well. 4. Add the green chilli and chopped coriander leaves. Mix well. 5. Serve as a side dish to pulao, biryani, rice and rotis.